Base layer of asphalt concrete in a road under construction. Asphalt is a sticky, black, highly viscous liquid or semi-solid that is present in most types of crude petroleum and in some natural deposits sometimes known as asphaltum. It varies in composition, based on the source of extraction and method of preparation. 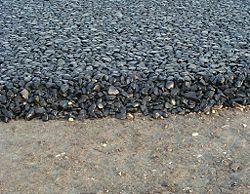 Its primary application is for road construction, where it is used as the glue or binder for pieces of the aggregate. It is also used for roofing shingles, cattle sprays, fence post treatments, and fabric waterproofing. The word asphalt is derived from the Middle English aspalt, which can be traced to the Late Latin asphaltum, and Greek ásphaltos (άσφαλτος), meaning "flawless." In U.S. terminology, asphalt (or asphalt cement) is the carefully refined residue from the distillation process of selected crude oils. Outside North America, the product is called bitumen. The road surfacing material is usually called 'asphalt concrete' in North America, or simply 'asphalt' elsewhere. Within North America, the apparent interchangeability of the words 'asphalt' and 'bitumen' causes confusion outside the road construction industry, although the definitions are quite clear within industry circles. Asphalt or bitumen can sometimes be confused with tar, which is a similar black thermoplastic material produced by the destructive distillation of coal. During the early- and mid-twentieth century, when town gas (also known as "manufactured gas" or "syngas") was produced, tar was a readily available product and extensively used as the binder for road aggregates. The addition of tar to macadam roads led to the word tarmac, which is now used in common parlance to refer to road making materials. However, since the 1970s, when natural gas succeeded town gas, asphalt (bitumen) has completely overtaken the use of tar in these applications. Natural deposits of asphalt include lake asphalts (primarily from the Pitch Lake in Trinidad and Tobago and Bermudez Lake in Venezuela), Gilsonite, the Dead Sea between Israel and Jordan, and Tar Sands. Asphalt was mined at Ritchie Mines in Macfarlan in Ritchie County, West Virginia, in the United States from 1852 to 1873. Asphalt can be separated from the other components of crude oil (such as naphtha, gasoline, and diesel) by the process of fractional distillation, usually under vacuum conditions. A better separation can be achieved by further processing of the heavier fractions of the crude oil in a de-asphalting unit, which uses either propane or butane in a supercritical phase to dissolve the lighter molecules, which are then separated. Additional processing may be undertaken by "blowing" the residue—that is, reacting it with oxygen. This makes the product harder and more viscous. Asphalt is most commonly modeled as a colloid, with asphaltenes as the dispersed phase and maltenes as the continuous phase (though there is some disagreement amongst chemists regarding its structure). Asphalt is typically stored and transported at temperatures around 300 degrees Fahrenheit (150 °C). Sometimes, diesel oil or kerosene is mixed in before shipping to retain liquidity; upon delivery, these lighter materials are separated out of the mixture. This mixture is often called bitumen feedstock, or BFS. Some dump trucks carrying asphalt route their hot engine exhaust through pipes in the dump body to keep the material warm. The backs of tippers carrying asphalt, as well as some handling equipment, are also commonly sprayed with a releasing agent before filling to aid release. Diesel oil is sometimes used as a release agent, although it can mix with and thereby reduce the quality of the asphalt. In the ancient Middle East, natural asphalt deposits were used for mortar between bricks and stones, ship caulking, and waterproofing. The Persian word for asphalt is mumiya, which may be related to the English word mummy. Asphalt was also used by ancient Egyptians to embalm mummies. In the ancient Far East, natural asphalt was slowly boiled to get rid of the higher fractions, leaving a material of higher molecular weight which is thermoplastic and when layered on objects, became quite hard upon cooling. This was used to cover scabbards and other objects that needed water-proofing. Statuettes of household deities were also cast with this type of material in Japan, and probably also in China. In North America, archaeological recovery has indicated that asphaltum was sometimes used to apply stone projectile points to a wooden haft. Poured bitumen has also been used as a damp-proof course in building. The largest use of asphalt is for making asphalt concrete for road surfaces and accounts for approximately 80 percent of the asphalt consumed in the United States. Roofing shingles account for most of the remaining asphalt consumption. Other uses include cattle sprays, fence post treatments, and waterproofing for fabrics. Asphalt road surface is the most widely recycled material in the US, both by gross tonnage and by percentage. According to a report issued by the Federal Highway Administration and the United States Environmental Protection Agency, 80 percent of the asphalt removed from road surfaces each year during widening and resurfacing projects is reused during the construction of new roads, roadbeds, shoulders and embankments. Mastic asphalt is a type of asphalt that differs from dense graded asphalt (asphalt concrete) in that it has a higher bitumen (binder) content, usually around seven to ten percent of the whole aggregate mix, as opposed to roller asphalt, which has only around five percent added bitumen. Another asphalt that is fast gaining global popularity is stone mastic asphalt (SMA). SMA's advantages over rolled asphalt is its high anti-skid qualities due to its high aggregate density and the lack of void content (air pockets). Another advantage of SMA is its longer durability over alternative road asphalt surfaces, but its manufacture and application, if not controlled closely, can result in slippery road surfaces due to excess bitumen pooling (bleeding) onto the surface. A number of technologies allow asphalt to be mixed at much lower temperatures. These involve mixing the asphalt with petroleum solvents to form "cutbacks" with reduced melting point or mixtures with water to turn the asphalt into an emulsion. Asphalt emulsions contain up to 70 percent asphalt and typically less than 1.5 percent chemical additives. There are two main types of emulsions with different affinity for aggregates—cationic and anionic. Asphalt emulsions are used in a wide variety of applications. Chipseal involves spraying the road surface with asphalt emulsion followed by a layer of crushed rock or gravel. Slurry Seal involves the creation of a mixture of asphalt emulsion and fine crushed aggregate that is spread on the surface of a road. Cold mixed asphalt can also be made from asphalt emulsion to create pavements similar to hot-mixed asphalt, several inches in depth and asphalt emulsions are also blended into recycled hot-mix asphalt to create low cost pavements. Sometimes asphalt can be mixed with the output from low-temperature thermal desorption. The world has become increasingly concerned about the global peak oil and perceived climate change problem in recent years due to the pollution that is released into the atmosphere. Most of the emissions are derived primarily from burning fossil fuels. This has led to the introduction of petroleum bitumen alternatives that are more environmentally friendly and non toxic. Bitumen can now be made from non-petroleum based renewable resources (bioasphalt). ↑ C. Michael Hogan. 2008. Morro Creek Retrieved October 23, 2008. Heat Island Effect U.S EPA. Asphalt Online Magazine of the Asphalt Institute. Asphalt Fumes National Institute for Occupational Safety and Health. This page was last modified on 20 April 2016, at 20:00.